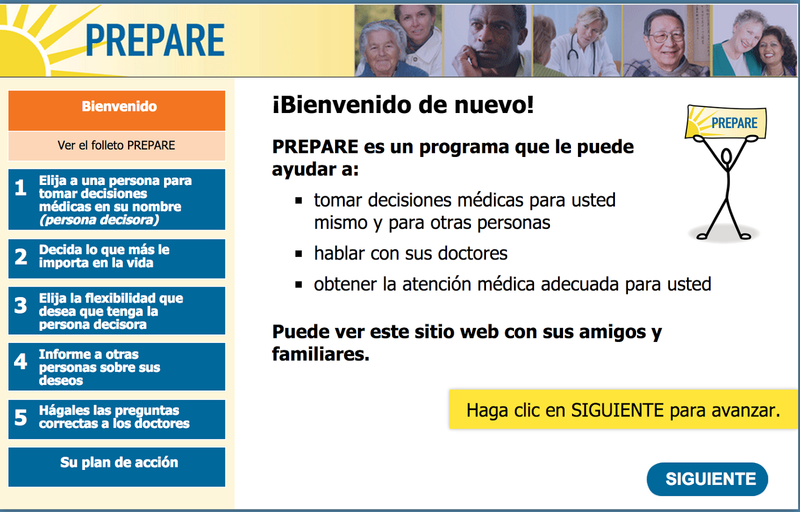 Advance care planning tool PREPARE, now in Spanish! Do you have Spanish-speaking patients? If you do, then point them toward PREPARE in Spanish! The rising tide of palliative care has not lifted all boats equally. For example, hospice use among African Americans decedents increased from 5% in 1992 to 34% in 2010. However, hospice use among white decedents increased even more, from 10% to 46%, over the same time period. Hospice use increased at a faster rate among whites than African Americans. The gap actually got bigger. We haven't paid enough attention to disparities. There is a real risk that many of the services, tools, and skills of palliative care may benefit majority patients more than minority. The explosion of palliative care may have the unintended effect of increasing ethnic disparities rather than reducing them. That's just one of the reasons that work like Prepare in Spanish is so important. We previously blogged about the launch of PREPARE (prepareforyourcare.org), an innovative online advance care planning tool. The central idea behind Prepare is to move advance care planning upstream, to help patients and surrogate decision makers prepare for in-the-moment decision making. Advance directives are not enough. PREPARE is a program that uses videos and personal stories to help people identify what matters most in life, communicate with loved ones and clinicians, and make informed medical decisions based on their values. PREPARE is appropriate for any person at any stage in their life and at any stage of readiness to engage in advance care planning. Prepare was launched to the public in 2013. Since then it has received close to 50,000 unique visitors from over 115 countries.